Why Does a Curveball Curve? With the World Series in full swing, most Americans would probably say they know the basic rules of baseball: the pitcher throws it, the batter hits it, three strikes and you’re out. But underneath it all, the rules that truly govern this game are the laws of physics. 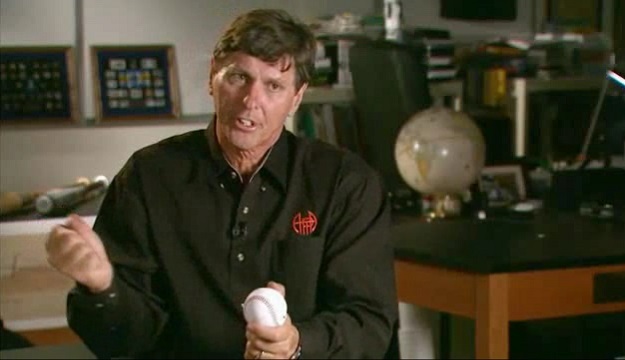 Robinson, who was interviewed several years ago by KQED for a TV story on the physics of baseball, uses the sport to teach his students how the universe works. To illustrate a sample lesson, he draws a baseball on a white board. Then he draws one arrow pointing forward from the ball, as if it’s going straight from the pitcher to the hitter, and one arrow angling up, to show the angular displacement of a curve ball. But sending your arm on that ride is a surprisingly complex task. It takes a biomechanical analysis to see just how intricate the throwing motion is. Big league pitchers get this done in a lab, using a 3-D, high-speed, infrared, eight-camera motion analysis system that tracks every aspect of the throw. The players wear skin tight clothing with reflective markers that the computer can pick up. These markers allow the computer to calculate the exact body angles, joint velocities, and timing. It can also analyze the physical kinetics (or joint forces and torques) placed on the body. Seeing the relationship between timing and velocity, between angles and spin, can help big leaguers make subtle changes in biomechanics to enhance their performance and reduce injuries. What works, that is, to get the ball to do exactly what the pitcher wants it to do—like get there fast. A 95-mile an hour fastball will get to the batter in four-tenths of a second. Newton's second law of motion tells us that the acceleration of an object is dependent upon two things – its mass and how much net force is acting on it. Translated: the harder you throw, the faster it goes. But pitching takes more than throwing hard. There are also external forces in play. Each pitch is fighting gravity and friction. 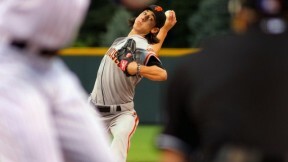 While external forces may cut down on momentum and velocity, a good pitcher will be able to use this to his advantage. Friction and gravity can make the ball do nasty things. A splitter, for example, looks like a fastball until it loses velocity; then it suddenly drops down toward the batter’s knees. And in case you’re wondering, that curve ball is not an optical illusion—it really does curve. How much it curves depends on how fast you spin the ball. A curve ball that spins 30 times a second can break as much as 17 inches. The reason the ball curves is a force called “lift.” Lift is the reason airplanes can fly, and it’s the force that allows sailboats to go faster than the wind. But how does the batter know in which direction the ball is going to break? The answer, said physicist Linda Shore of the San Francisco Exploratium, is simple. Just figure out which direction the front of the ball is spinning. Oh. That’s all it takes? Once the ball leaves the pitchers hand, the batter has barely the blink of an eye before it crosses the plate. The batter wants both power and accuracy. And bat speed is the key to power, said Jon Zuber, a former major leaguer with the Philadelphia Phillies and member of the University of California Hall of Fame. As part of KQED’s visit to Cal’s Evans Diamond to film the physics of baseball TV story, Zuber demonstrated that distance a batter’s hands have to move to get from ready, to the point where the bat makes contact with the ball. “I need my hands to get from there to there, short and quick, as fast as possible,” he said. To get the most out of the hit, the batter can’t rely only on power; he needs accuracy. He needs to slam the ball with a particular part of the bat, known as the sweet spot. The reason? Physics, of course. The collision of a ball on the bat lasts only about 1/1000th of a second. In that instant the batter can exert up to 8,000 pounds of force on the baseball. The ball is now headed across the field; what’s the equal and opposite reaction? A node is the point along a wave where the wave crosses the zero line—where it has minimal amplitude. When a ball hits a bat it causes waves of vibration. So when a hitter gets the sweet spot onto the ball, there’s less vibration and the bat imparts all that kinetic energy into the hit. You know you’ve hit the sweet spot by the sound of the crack. 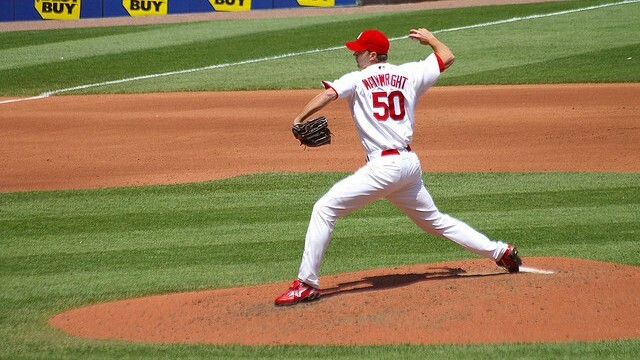 So next time you’re watching the St. Louis Cardinals’ Adam Wainwright throw a curveball to a Red Sox slugger, listen for the sound of physics at work in America’s favorite pastime.